Michael Fitzpatrick started his art career in the mid-sixties by attending Art Center College of Design in L.A. After graduating he went to work for D’Arcy, McManus, Masius Advertising in New York City as an art director. Next he moved back to the West Coast where he started and ran his own ad agency: Fitzpatrick and Walker. Drawing and design were always a large part of Michael’s daily activity: in New York it was drawing storyboards for TV ads by the hundreds; in California design and illustration were the emphasis. All this commercial activity was only a backdrop for Michael’s real love – painting. In the early nineties he broke away from the nine to five and did his fine art in earnest, painting virtually every day since. He has many collectors around the world, and shows in galleries in Napa Valley and Sausalito. He held the prestigious position as resident painter at Domain Chandon for two years. 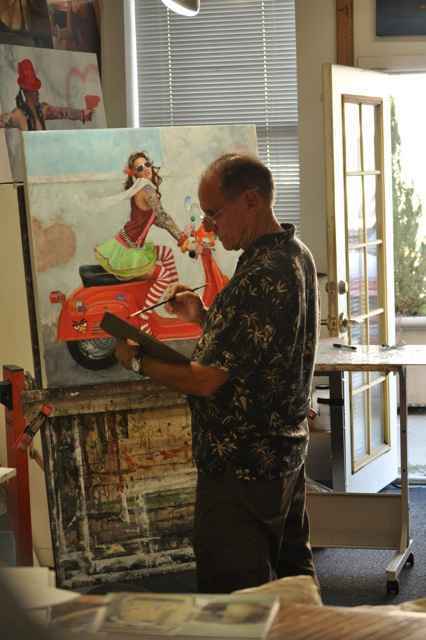 Michael paints in oil in a traditional style allowing him to fully utilize his classical training. The perceptive viewer will also find strong elements of his graphic design background. While he paints mostly figurative, still-life and landscape are also very much represented in his body of work.